I’m sure like me, you’ve been seeing more of these link sceptic articles cropping up recently. Some of them have strong enough points that it’s definitely got me thinking about our own SEO and content marketing strategies at NinjaOutreach. So, we did our own research and some testing of our own. Google’s Andrey Lippatsev actually said that links are among Google’s top two ranking factors. Through our competitor link building campaign, which we started in 2016, we were able to acquire thousands of backlinks which contributed to our site reaching a domain authority (DA) of 50-plus. Link building still works. If done carefully, it can bring your business tons of traffic and authority on Google. 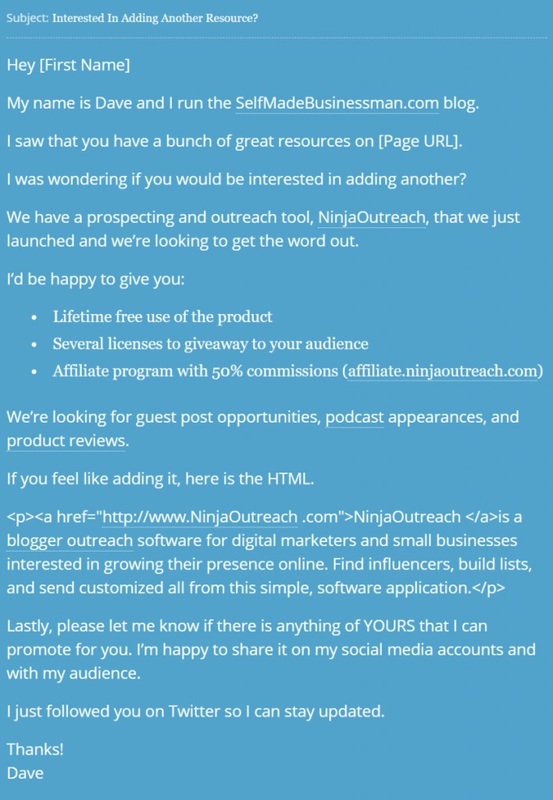 And if you want to reach as many opportunities as you can, I’ll share with you some tactics we’ve used to build links, along with how we used NinjaOutreach to accomplish these link building campaigns much faster. There are tons of ways to get links. In fact, some specialists have already compiled a list of hundreds of strategies. Of course, it’s not as easy as one, two, three. You’d need to do some heavy prospecting and outreach—and that’s where time can just slip past (and fast) under your nose. Good luck if you’re going to do this manually. But if you want to get things done faster, you can get ahead by using a tool. And that’s what we made NinjaOutreach for. 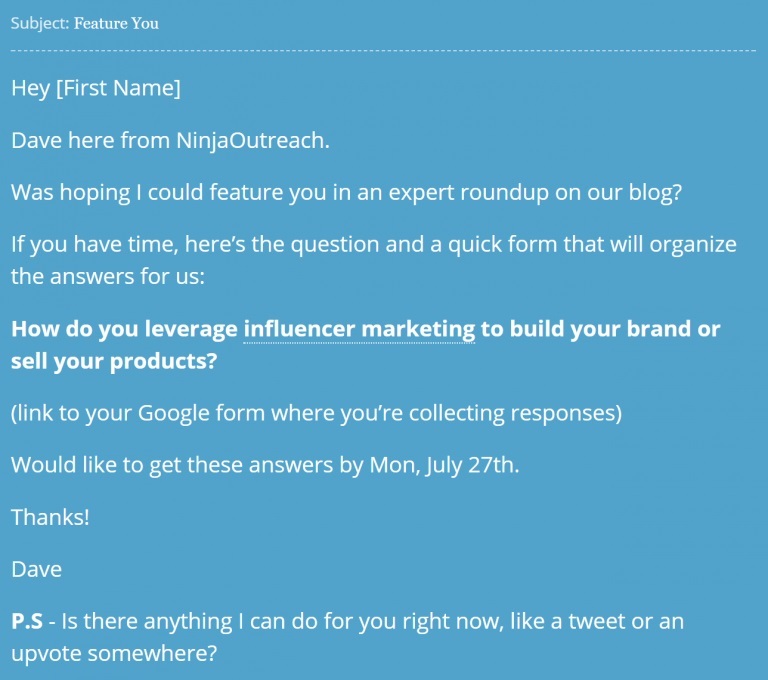 In this tutorial, I’ll teach you how to use NinjaOutreach to expedite your link building campaigns. I’ll also discuss the top link building tactics that, from our personal experience, gave the most impactful results. Broken link building is a white-hat link building tactic where you identify sites that have broken links in their posts. These broken links should refer to an item or content that’s similar to yours so you can then notify the webmaster about the broken link and recommend your own working link as an alternative. In this case study, they were able to acquire 17 backlinks in just one day! Here’s how you can use NinjaOutreach for that. Let’s say you wrote a post about “brand storytelling,” and you want to find other brand storytelling posts with broken links in them (or that are broken links themselves). Go to NinjaOutreach Prospecting > Promotion Opportunities tab and type your keyword “brand storytelling.” Click the box for Exact Match then hit Search. Click the filter and set the Domain Authority (DA) to at least 30. That way, you get more high-quality prospects. Review your prospect results, then click Save All. Choose the first 50 prospects, then add these into a list or create a new one. Any duplicates will be removed from the results if you redo your search. So depending on the time you have, redo your search and keep adding more prospects until you accumulate a list of at least 100 to 3k. 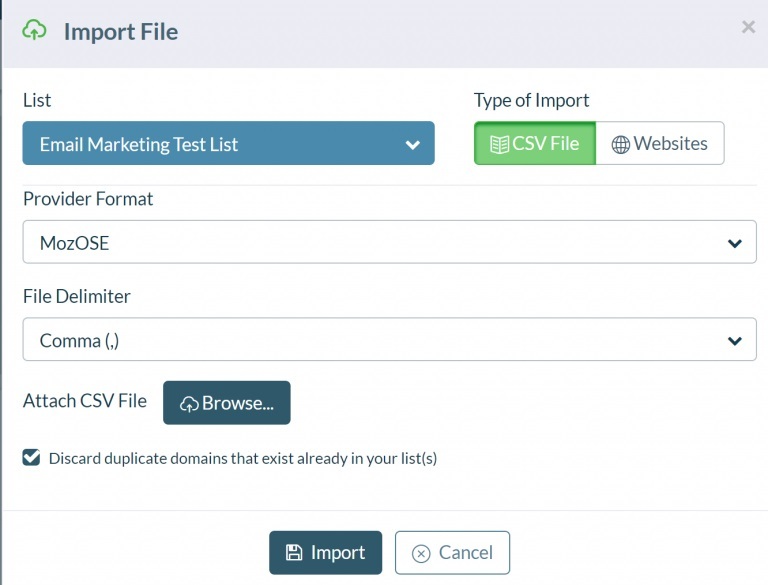 Now export your CSV, open it, and look for the column that has the page URLs. In this case, it’s column G.
Next, you need to check the links for 404s. To do that, You can use a 404 checker like this chrome extension. Once you install it, you can load each of your target pages and run the extension. It then scans each page and highlights any 404 links in red. Check the 404s to see if the content it’s linking to is similar to yours, which makes it okay for you to suggest your own working link as an alternative. If it fits, keep the prospect in your CSV. If it’s a negative, delete it from your sheet. Keep doing this until you’ve reached at least 50 prospects or exhausted your search results. After this point, you can actually start your outreach to the webmasters that have broken links. However, if you want to add more prospects to your list and thus, up your chances of getting positive responses, it’s best to trace other people who’ve used the same broken URL too, which you can do by putting the link in a backlink checker like Moz. Going back to your original spreadsheet, copy all the URLs in the column that has the page URLs. In this case, it’s column G.
Next, open up a free bulk link checker such as this one, which allows you to check up to 50 links. Copy paste the page URLs into the form field and click submit. Once the results are in, sort by Status so that all 404s are grouped together. Those are your broken links. Tag them in your spreadsheet as broken. Now that you have identified all the broken links, it’s time to find out everyone else who might have linked to these dead URLs. To do that, you can use tools like MOZOse, Ahrefs, or Majestic. For this example I took one broken url, and used Moz’s free OpenSiteExplorer to identify all the other bloggers that linked to this dead page. Now, you can export these results into another CSV and import to NinjaOutreach. When importing, just choose MozOSE in the Provider Format. This adds more new prospects to the list. To review your prospect list, go to Lists> Your Lists of Leads, and click the list of leads you need to review. Once you’ve finalized your list, it’s time to do your outreach. To start your outreach, integrate your email with NinjaOutreach first. Next, you’re going to need a proper template. Got to the Outreach tab and click Templates to see our list of template examples. To access even more templates, you can click Create Template, then Load Pre-Written template. The dropdown will show you even more templates to choose from. Below is one of our pre-written templates that you can reuse or modify. Once you’ve decided on a template, you just need to set up your campaign and you’re done! At this point, you can either sit back and wait for any replies, or you can set up another link building campaign. Competitor link building is much like broken link building, but with a subtle twist. Instead of using keywords about your target topic, you search directly for all the bloggers who have linked to one or more of your competitors. The rationale: if a blogger has written about or linked to a business or product similar to yours, chances are, they may be interested to check you out for comparison. To start prospecting, create a list of other sites or products that you think are similar to yours. For example, if you’re a digital marketing tool, run a search for that keyword. Below is a query you can use with an advanced search operator to exclude your site from any results. You can do this search on the NinjaOutreach platform or Google. If you use NinjaOutreach, you can review the search results from there, delete bad ones, and save the prospects that fit into your list. If you use Google, set Google settings to display up to 100 results. Import the results to your NinjaOutreach account. Here’s how. 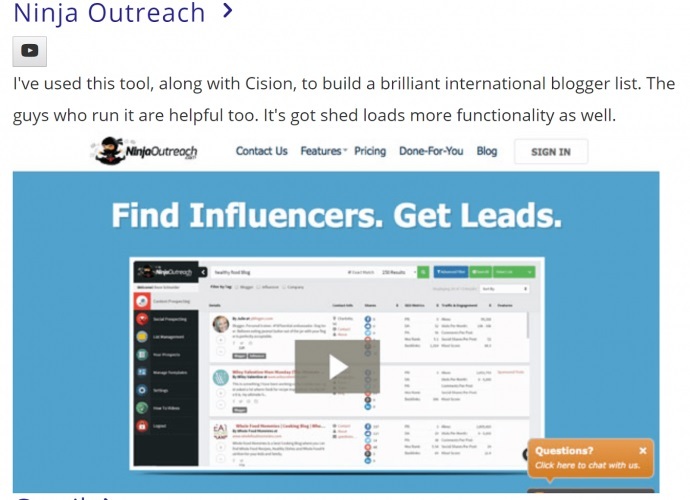 Review your list by clicking Leads > Lists of Leads. Sort your list by number of backlinks so you can target which sites to prioritize—the ones with the most backlinks, of course. 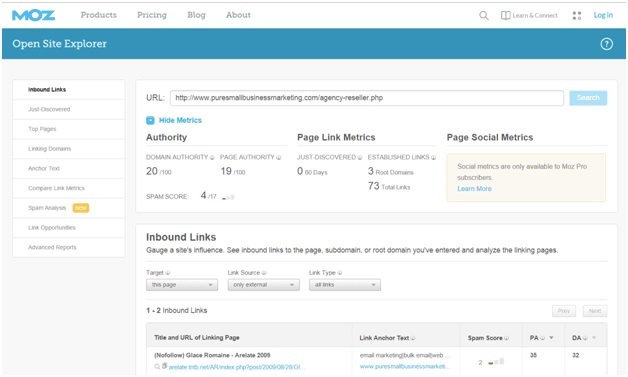 From your list, pick a URL and paste this into a backlink checker tool. In our case, we use Ahrefs. Enter the URL into the search bar, choose the Exact URL option, then hit Search. Click the Backlinks section to show backlinks, click All links, then choose the Live links option. You can also choose to show only the Dofollow links, which we did. Otherwise, you can simply show All links. Once done, just click the Export button to download the results into a CSV then import this CSV into your new outreach list. Here’s more on how to import and export lists with NinjaOutreach. These new prospects are the ones who’ve linked to your competitor and it’s time to review their articles so you can craft a proper outreach plan. For example, if you found a tool roundup article, this is a pre-written NinjaOutreach template you can use or modify to reflect your particular situation. 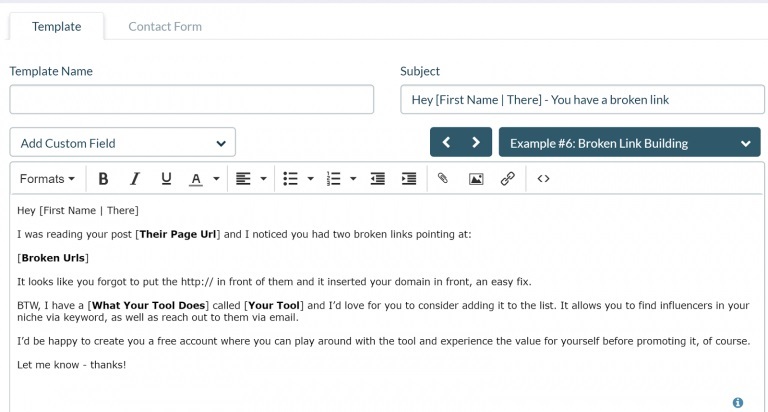 Set a followup email and wait for responses. 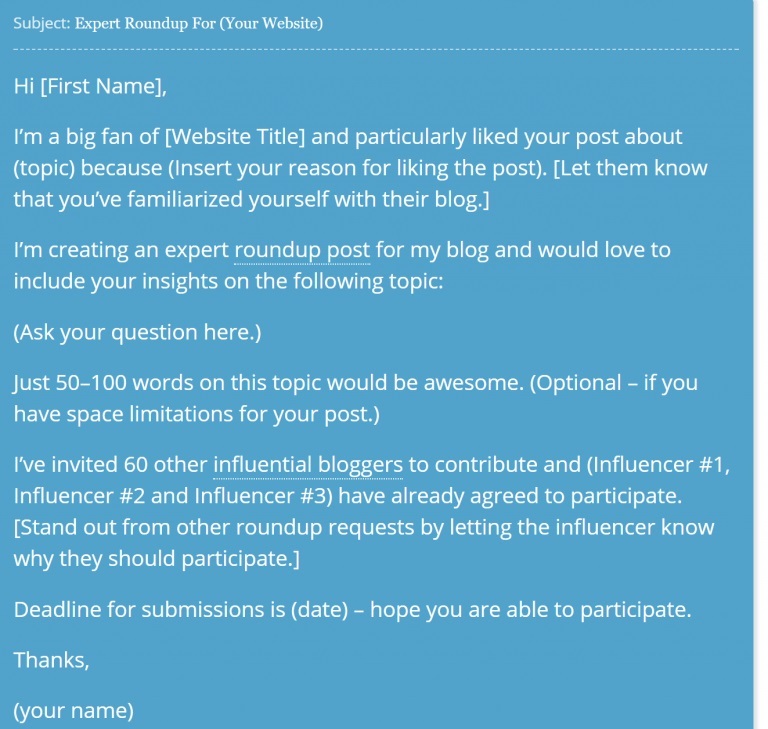 An expert roundup is a massive list-type post where you reach out to a bunch of influencers and, in exchange for a backlink to them, you ask for these expert’s input about your topic—usually a question in their niche that they can easily answer. A good number to go with would be to feature at least 30 to 50-plus experts. You will quote them and link to them. Once your post is published, you reach out to these experts one more to inform them that the post has been published, give them a URL, and a Click to Share link for their social media. If the experts took the time to contribute to your roundup, it would also be in their best interest to help you promote it, so if you get a good response rate to your roundup request, then it’s a win-win situation. 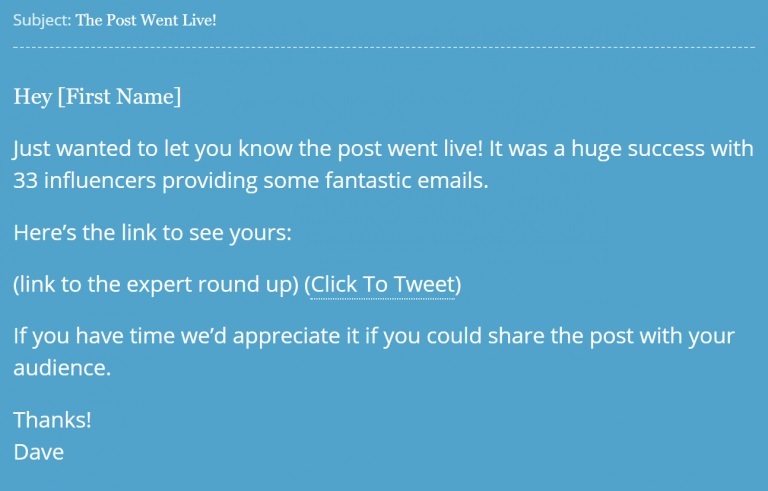 Doing expert roundups has been one of our most effective link building tactics. It’s free, can potentially feature a ton of influencers, and are most likely to get backlinks from these high-powered experts as well. Say you want to create an expert roundup about SEO trends for 2018, for example. Prospecting is pretty much the same. Just go to Prospecting > Social Influencers/Most Shared Content/Find Leads, enter the keywords of your niche, and filter the results on key metrics such as DA, engagement, followers, etc., to make sure they have a large following and will drive you traffic. To set up your outreach campaign along with your automated follow ups, read this. To manage your campaigns and lists, read this tutorial. To manage your campaign deadlines, create a dedicated list and add a tag for the deadline of the response to your campaign. This way, you’ll be constantly reminded every time you see it. 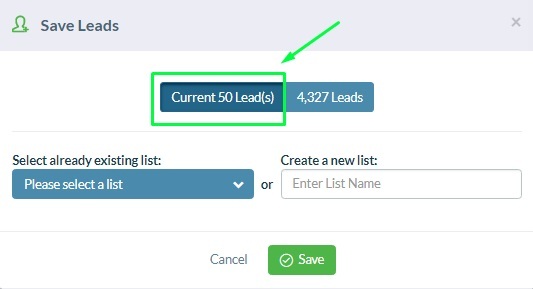 Go to Lists > Lists of Leads then click Create List. Name your list and save your prospects in there. 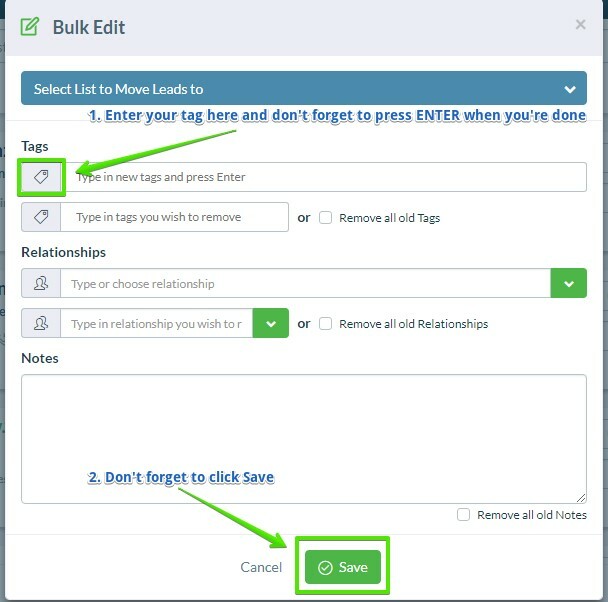 If this doesn’t work, go back to your list, click the bulk actions checkbox at the top left, then click the edit button. If you need to set separate deadline tags for the prospects in your list, check the boxes on the far left of the prospect card then click edit. Enter your tags in the tags input field, don’t forget to hit Enter, and click Save. Now, every time you see a prospect card related to your expert roundup, you’ll see the deadline in the tags area. You can also filter prospects in your list according to their response deadline. Just go to Filter lists > Tags and choose the deadline from the dropdown. For more on how to filter for tags and relationship labels, read this. Another thing you can do is to bulk tag all your prospects as No Response at the start of your campaign. As before, check the bulk actions checkbox, then click Edit. Add the tag No Response, hit Enter, then click Save. Later on, when you want to follow up, you can do a filter on the tag No Response, and you’ll have all the prospects neatly lined up. You can then choose to follow up with prospects who have done either of the actions in the dropdown below, such as those with follow-ups due, have opened your email, clicked a link, etc. As responses come in, go to the prospect card of those who replied and overwrite the their no response tags with a yes response. This way, you can easily filter by prospects who responded later on and you’ll know exactly who to reach out to once the post is published. We’ve given you the tips. Now, we’d like to give you some of our outreach template recommendations for expert roundups. For your initial outreach, you can use the following. 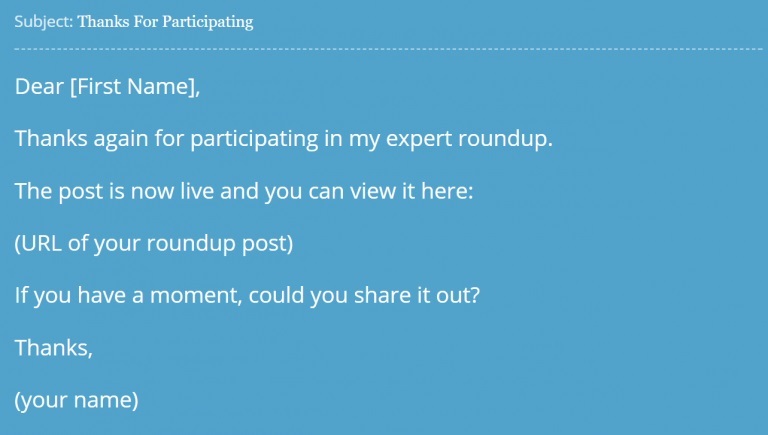 So, you’ve published your expert roundup post and it’s time to thank your influencer participants. For those kinds of follow-ups, we also have the following template recommendations. Modify them as you see fit. Resource page link building is the process of looking for high-authority resource pages relevant to your niche. You send the webmaster a pitch to add your website to its list of resources, which means you also get a backlink. If done right, resource page link building can be a great 80/20 link building strategy. They are powerful pages to get a backlink from, and yet it’s easy to get listed. This is because the pages themselves are intended to be resources, so admins are always looking to add links to them. As long as you have a valuable resource, you have a good shot at getting a link. Now prospecting to create a decent sized list and doing outreach to all these prospects is now walk in the park. That’s why in our campaigns, we’ve always used NinjaOutreach to get things done faster. Below, I’ll teach you how you can use our tool for your own resource page link building campaign. Say you want your website to get listed in resource pages for marketing. The most effective way to find people who have resource pages is through the Prospecting tab. Just go to Prospecting > Find Leads then click Filter > All Featured Pages, and choose Resource Page. This will filter the results to show only Resource Page types. Next, just enter your niche keyword, click Exact Match, then hit Search. Since you’re not using any advanced search operators at this point, you’re likely to get more results. You can manually filter, sort, or review your results, then add any prospects that fit into your list. Hint: You may want to sort or filter by a Domain Authority to make sure you are prioritizing the highest authority pages. Now for more targeted (but lesser) results, you can run your search with any of these advanced search operators. 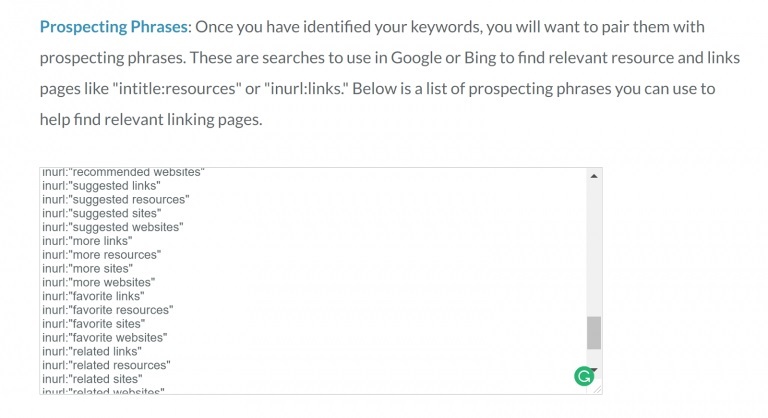 You can also pair them with variations of what Moz calls Prospecting Phrases. You can try variations of these using “resources,” “resource page,” and “tools” as well. Once you find what you need, you can add and manage your prospects straight from within NinjaOutreach. If you don’t find what you need from within the platform, you can make the same searches in Google, then just import the results into NinjaOutreach. NinjaOutreach will automatically remove any duplicates. Once you’ve finalized your prospect lists, it’s time to set up your outreach campaign. As I’ve mentioned, before embarking on any outreach campaign you’ll need to integrate your email address with NinjaOutreach first. Below is an example of a script we’ve used in our own resource page link building. The topmost effective link building tactics that we’ve used, tested and proven with NinjaOutreach. Try it out with the tool and let us know how you do. As always, for any other questions, our Support Ninjas are always ready to assist you.